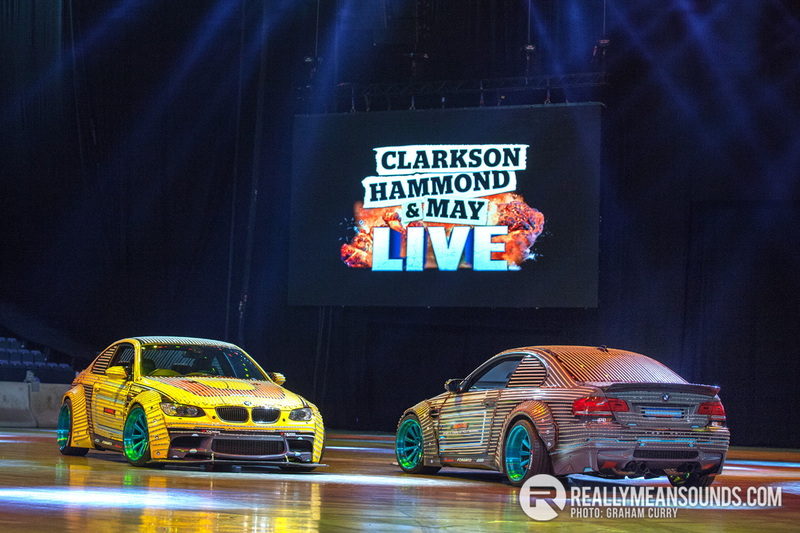 Clarkson Hammond and May Live held it’s first live shows under the new name in Belfast this weekend. In the car football segment of the show, they used drivers from the province in the Northern Ireland team. 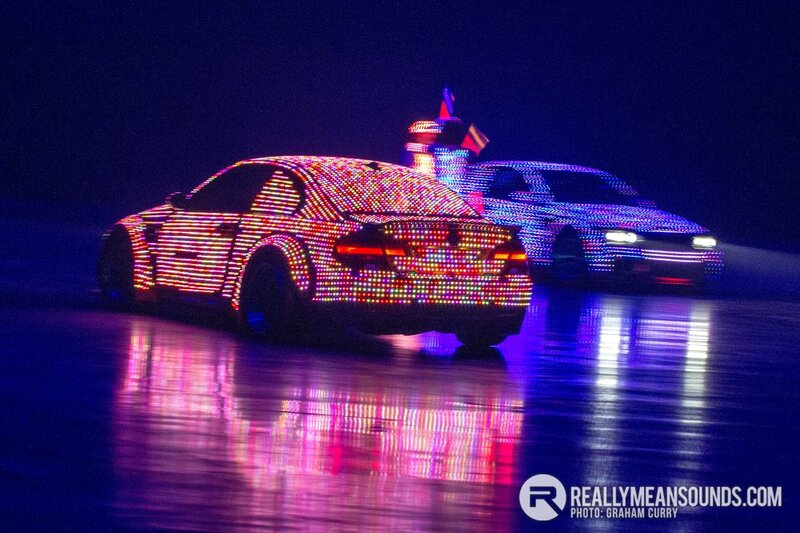 However the links between NI and this iconic live motoring spectacle are much deeper than you would give it credit: RMS gives an exclusive look into the story of the LED M3s. Several months ago in developing a new segment to feature cars drifting around performers (back then under it’s pre-fracas Top Gear Live moniker), the producers decided on using a pair of E92 BMW M3s. With 414bhp on tap, limited slip differential as standard and a thumping 4.0 V8 sound track, you can understand why. The BMW M-Cars were promptly purchased and despatched to Durban, South Africa, in standard trim for shakedown testing and a performance assessment. A resounding thumbs up from the team kicked off the second stage of the project, and this is where it becomes really fascinating, the cars were back in containers… Northern Ireland bound! An E92 M3 is undoubtedly a great looking road car, with its flared wheel arches giving it a squat and purposeful rolling stance. For an international motor show that is a multisensory visual and pyrotechnic spectacle, though these cars needed to be so much more. There was a long build list of modifications to bring the cars up to the jaw dropping show standard required, so the build was entrusted to Lisburn based Momentum Motorsport. The bill of materials, besides being eye watering in cost and top drawer in terms of quality, impresses because of the thought and precision that goes into the machinery used in the Clarkson, Hammond and May Live events. First up is the stunning wide arch body kits, sourced from the exclusive manufacturer, Liberty Walk in Japan’s. Featuring copious amounts of carbon fibre, vents and recesses, the style and level of detail is incredible. The stunning pearlescent split wheels which come from California based outfit Forgiato, are a three piece affair. The custom, anodised teal finish, complimenting the bodykit to a tee. Suspension was courtesy of Extend Racing adjustable coilovers, and the V8 soundtrack was performed by an Innotech Performance Exhaust system complete with dynamic valve control. Naturally with the heavy drift workload on uncompromising arena surfaces, the correct tyre choice was essential for safety and control for high speed in a confined space. Yokohama provided a semi-slick compound road tyre just for the purpose. The brakes were also upgraded with Nashin items, and Corbeau carbon fibre backed bucket seats were installed to hold the stunt drivers firmly in place under the lateral forces they would endure in the arena. Momentum Motorsport completed the mechanical build with custom fabrication including a hydraulic handbrake and a quick release bumper system. The coachwork was carried out in tandem by local man Kenny Wylie, and upon leaving Northern Ireland the cars are deemed to be fighting fit for years of thrashing on these events. The final touches were then carried out in GB, firstly with a vinyl wrap; however the finishing touch and the most daring styling cue dreamt up by the producers was the addition of a Pixel Video Suit that would turn these already epic cars into futuristic Tron style drifting LED displays. Carried out by LED live performance company Feeding the Fish, the BMWs were then covered with nearly 10,000 LEDs each (accounting for some 600m of cabled LEDs), and graphics were programmed to co-ordinate with the music, lighting and dance performers on the stage. The result is a stunning, futuristic live action set piece that is visually mind-blowing and aural delight – thanks to those high revving V8s. I was wondering last night whether these M3s were manual or DCT? Loved them. | I was wondering last night whether these M3s were manual or DCT? Loved them. They are manual - think there is a gearstick shot in there somewhere! Looked and sounded fantastic!! Really screamed. So much love for these ! They looked awesome on the show, and some technical feat. Months of programming apparently on the LED sequences. Was the sound of them got me. Want one! Yeah agreed - I thought they would have done a bit of revving and driven them out 1 by 1.